We, because of price and spouse are "Loyal to Royal". But I&apos;m serious thinking not such a great idea. If they are going to continue using older ships they really need to stop a day and CLEAN them thoroughly!! Entertainment was Excellent!! This class ship (as we sailed back-to-back with the Navigator of the Seas) won&apos;t be our choice anytime soon. **The plus is the food was good and entertainment also very good. The service in the dining room was lacking and definitely not what I would expect from Royal Caribbean. 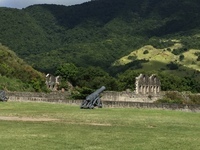 We had a wonderful excursion at St. Kitts, we&apos;ve visited the island but never took one before. I highly recommend. It was for the Fort and Plantation house. Great Price and 5 star if you like history & views. Royal Caribbean needs new activities for folks that don&apos;t wish to sunbath & drink entire trip. Heck, I&apos;d enjoy history lectures of islands visiting, etc. Just something new please. Worst Room EVER; great excursion! We, because of price and spouse are "Loyal to Royal". But I&apos;m serious thinking not such a great idea. If they are going to continue using older ships they really need to stop a day and CLEAN them thoroughly!! This class ship (as we sailed back-to-back with the Navigator of the Seas) won&apos;t be our choice anytime soon. **The plus is the food was good and entertainment also very good. The service in the dining room was lacking and definitely not what I would expect from Royal Caribbean. We had a wonderful excursion at St. Kitts, we&apos;ve visited the island but never took one before. I highly recommend. It was for the Fort and Plantation house. Great Price and 5 star if you like history & views. Royal Caribbean needs new activities for folks that don&apos;t wish to sunbath & drink entire trip. Heck, I&apos;d enjoy history lectures of islands visiting, etc. Just something new please. Our room smelled like a Cat has "sprayed" in the shower. The poor room attendant tried everything. They finally moved us at the beginning of day 5; REALLY??? the &apos;better&apos; room was older and must have been below the ship laundry. If you love to swim in really wonderful water, this is the place, no excursion needed!! We just love walking around the city - lots to see; this trip just wandered around and great shopping at a local Marshalls!! I do recommend the Forts though!! Great surprise if you love history and views, I recommend!! Also great for photo takers too. Really nice house and grounds wish there was more time, rushed.